But how about we add some stability to this motions now? Well, that's just what the pedal point, or simply pedal, does! The pedal in this case doesn't describe the physical accessory that piano and keyboard players alike know so well, and which usually serves to sustain a sound in time once the keys have been released. But the concept is not too far from it. In fact, the pedal point is a note that appears throughout several consecutive chords, be it because it's repeated or sustained. Usually it's the dominant or tonic of the song's key or the modulation key (if you want to learn more about modulation, refer to articles 17 and 22). The pedal point is called single if only one pedal note is sustained (the tonic or dominant), but it can also be double when two pedal tones are played simultaneously. They can obviously be brief or long, be used in major and minor mode, follow cadences or even be chords without any functional relationship. In the following example, the pedal tone C is sustained throughout the entire chord progression. On the first two bars you could actually say that there's a double pedal with the tonic and dominant (C and G). You're probably asking yourself right now: how can this note bring any stability? Especially since it doesn't prevent the alternation between dissonance and consonance. Well, the pedal tone acts like an anchor throughout a progression of chords. A note that is sustained or repeated allows the song to settle, to smoothen out the shifts between dissonances and consonances, or even to create expectation. The stability of the pedal point also allows you to emphasize the coherence of certain chord progressions and soften others. And in certain cases, the pedal allows you to break the circle of fifths. This chord is particularly useful to illustrate the way the pedal point works. But we first need to explain a bit better what it is. The sus4 chord is a somewhat special chord. Generally speaking it's a dominant seventh chord where the fourth replaces the third. Hence, the fourth is "suspended." And this fourth confers a very particular character to the chord, doing away with the tritone and making it lose its dominant chord label. Moreover, the following example shows that in order to introduce this famous fourth, the sus4 chord share ¾ of the notes of the II degree of the scale, a sub-dominant chord. 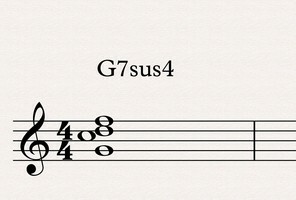 However, contrary to a classic sub-dominant chord, the sus4 chord doesn't have the urge to resolve to the dominant chord. It is usually used this way to suspend the arrival of the dominant chord, or to outright oust it in other cases.